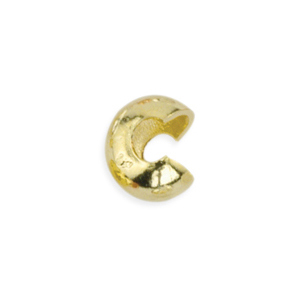 For jewelry that looks like a professional design, use this crimp cover. Crimp covers are great for camouflaging crimps in necklaces, bracelets and other designs, and this particular component presents ideas with a cool silver shine. Use it to finish a jewelry design laced with any color scheme since silver complements any shade. This will cover crimps that are up to 3mm in size. Available in Silver and Gold Plate, 144pc/pack.